The researchers investigate ultra-wideband (UWB) communications—a technology that enables high data rates over short distances with low power consumption. UWB devices transmit short pulses, thus spreading the signals to be transmitted over a large bandwidth which in turn makes the connection robust against narrowband interference. 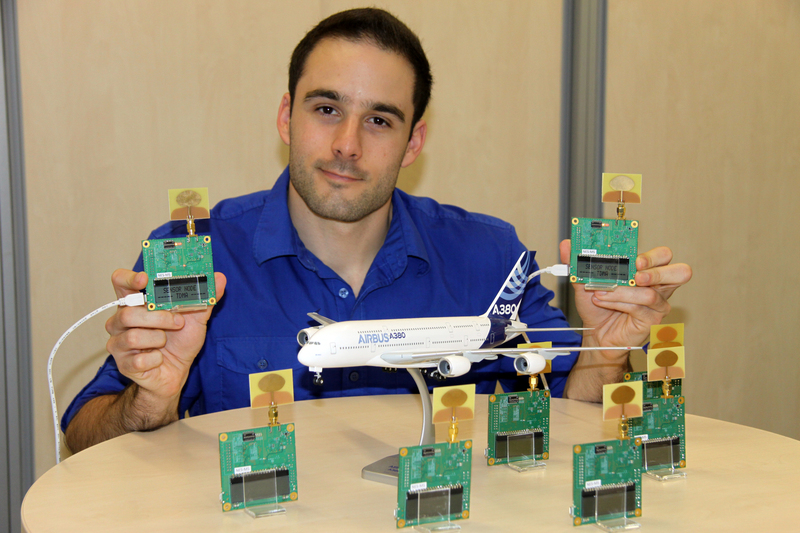 UWB may serve as a complement or alternative to other wireless technologies currently under study for airplanes. “We use IEEE 802.15.4-2011 compliant transceivers from DecaWave exploiting a bandwidth of 500 MHz,” researcher and doctoral student Daniel Neuhold says. He is very excited about his research: “I programmed a synchronization concept and implemented a slot structure in the network.” The team performs wireless measurements in a cabin mockup of a plane and evaluates the received signal strength with reference to the placement of the devices and the level of passenger mobility. The empirical cumulative distribution function of the received signal strength is computed from the collected measurement data. The basic ideas and first project results were presented at the International Conference on Embedded Wireless Systems and Networks (EWSN) in Graz (Austria) in February. Further experimental results were discussed at a student workshop at IEEE INFOCOM in San Francisco in mid April. The text of this blog entry is based on contributions from all project members. Funding has been received from the KWF under grant 20214/26481/38805.